Detail of dorsal-fin and midbody. 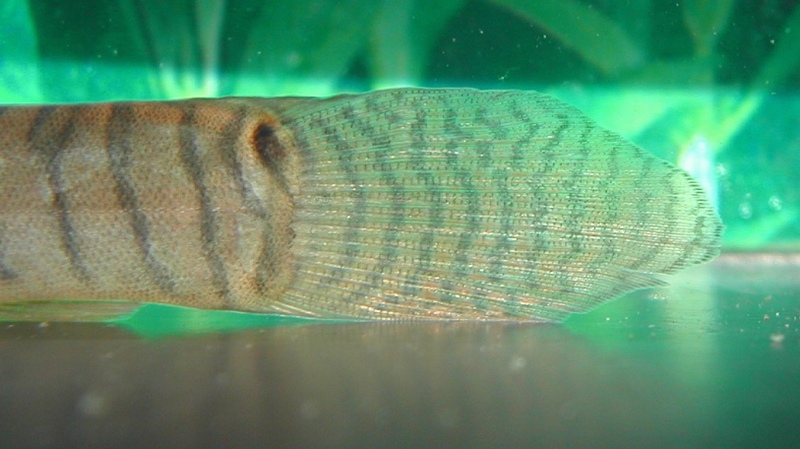 Detail of caudal-fin and posterior portion of body. Detail of head and mouth. Cobitis pavonacea McClelland, 1839; Noemacheilus pavonaceus (McClelland, 1839), Nemacheilus pavonaceus (McClelland, 1839). Acanthocobitis: from the Greek acantho-, meaning ‘thorny’, and kobitis, meaning ‘a kind of sardine’. pavonacea: from the Latin pāvō, meaning ‘peacock’, in reference to the dark spots on either side of the upper caudal peduncle, which McClelland likened to ‘the moons of the peacock’. Type locality is simply ‘Assam, India’, and this species appears restricted to the Brahmaputra River drainage in Assam State, northeastern India and probably the neighbouring state of West Bengal given that the synonymous A. longipinnis (see ‘Notes’) was described from the Ganges drainage. Singer and Page (2015) restrict this species to the Brahmaputra and Ganges river basins of northern India and Bangladesh [p. 398]. We’ve been unable to obtain any detailed information thus far. One of the largest nemacheilid loaches with an adult size of 120 – 156 mm, the latter figure quoted for the holotype of A. longipinnis by Grant (2007). Base dimensions in excess of 120 ∗ 30 cm will be required long term. Will do well in most larger, well-maintained tanks if plenty of hiding places are provided, and should not harm softer-leaved plants. However we recommend keeping it in a set-up designed to resemble a slow-moving or marginal section of stream or river with a sandy substrate and perhaps a few water-worn boulders. This can be further decorated with driftwood roots and branches arranged to form some shaded spots, plus a few handfuls of dried beech, oak or Terminalia (Indian Almond) leaves. Adaptable plants such as Microsorum, Bolbitis or Anubias spp. can be grown attached to the décor and bright lighting will promote the growth of aufwuchs which will add to the natural feel. Although a high level of water movement isn’t essential it should also do well in a mature hill stream-type set-up with a rocky aquascape. Doesn’t appear to be herbivorous so probably preys on insect larvae and suchlike in nature. The few reports of captive care that exist suggest this species is bold but not aggressive although its adult size dictates that very small tankmates are best omitted. 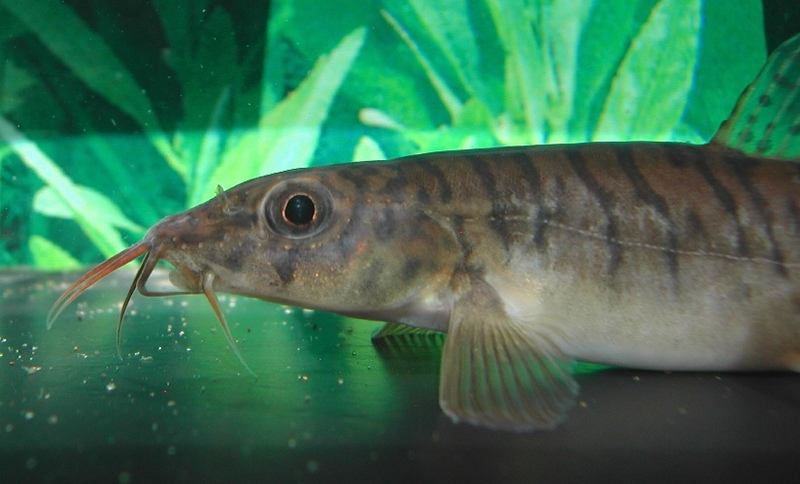 Similarly-sized fishes inhabiting comparable environments in nature such as many cyprinids and loaches should make the best companions. 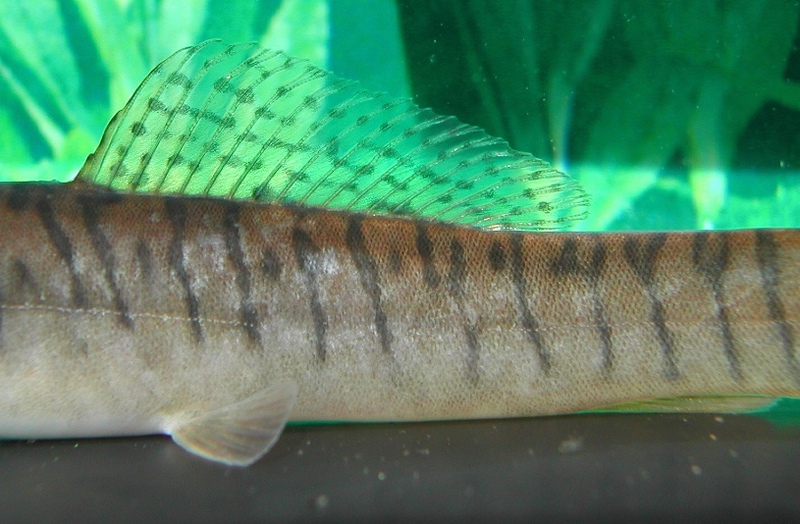 Potentially compatible species from the Brahmaputra include Acanthocobitis botia, Botia dario, Barilius barna, B. shacra, Chagunius chagunio, Crossocheilus latius, Devario acuticephala, Garra arupi, G. kempi and G. lissorhynchus. We think it might be possible to keep a group of these in a decent-sized tank although have been unable to obtain definitive confirmation. Adult males have an enlarged suborbital flap and should be noticeably slimmer than females. 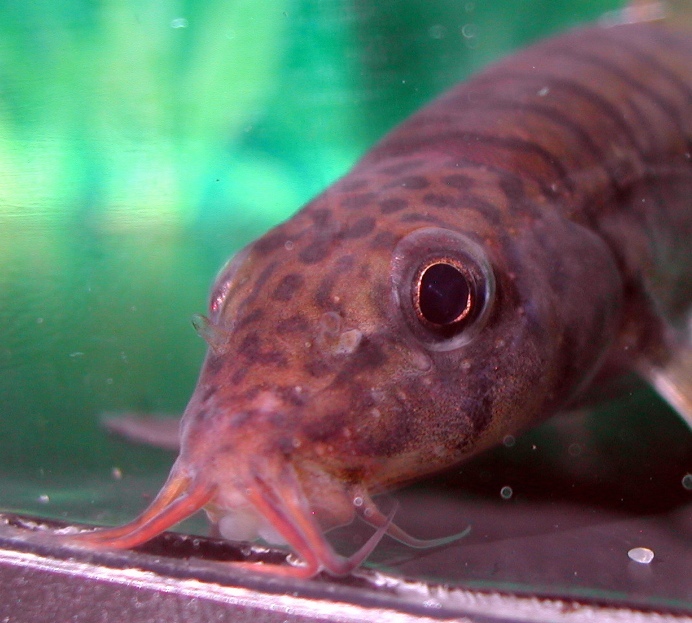 Has not been recorded in aquaria as far as we know and successes with related species have invariably involved one or two fry appearing in larger, mature set-ups. UK aquarist Mick Wright has had great success breeding A. zonalternans under controlled conditions, though, so an upscaled version of his approach would perhaps be a good starting point – see the relevant section of that species profile for more information. 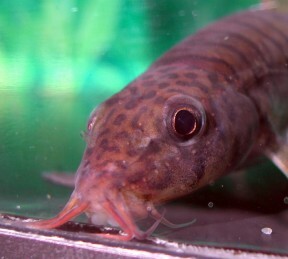 This species isn’t common in the trade but occasional specimens may be found among shipments of wild caught fishes from northeast India, and it’s sometimes seen on sale as ‘panther’ or ‘puma’ loach. In current literature it’s often listed with the scientific name Nemacheilus pavonaceus but was described as a Cobitis and has also been referred to Noemacheilus and Acanthocobitis. Following Grant (2007) the latter is correct. According to Kottelat (1990) the chief distinguishing characters for the genus Acanthocobitis are: possession of 9-18½ branched dorsal-fin rays; colour pattern without black basal caudal bar, but with an ocellus at upper base of caudal-fin; upper lip withor without several rows of papillae; lower lip with a broad median interruption and a widened, papillated padon each side. The type species Acanthocobitis longipinnis Peters, 1861 had been considered a junior synonym of A. botia [as it then was] for a number of years whereas it’s actually synonymous with A. pavonacea. This is significant because A. pavonacea has been deemed ‘taxonomically distinct’, i.e., not closely related to other species of Acanthocobitis, by several authors, the clearest differences being the relatively long dorsal-fin (14-18 rays), tapering/spear-shaped caudal-fin (vs. rounded, truncate or slightly emarginate), relatively elongate, slender body and adult size. Grant (2007) suggested the subgenus Paracanthocobitis for them but Kottelat (2012a) remarked that the identity of A. longipinnis requires verification and he later (Kottelat, 2012b) classed Paracanthocobitis as a questionable synonym of Acanthocobitis. Singer and Page (2015) treat Acanthocobitis as monotypic, containing only A. pavonacea. Acanthocobitis longipinnis is considered to be a synonym of A. pavonacea (Grant, 2007); however, the only available specimen of A. longpinnis is the poorly preserved holotype. Collection of fresh material may show the two forms to be distinguishable from one another [p. 398]. By its original synonymy of type species, A. pavonacea must remain in Acanthocobitis, and following Grant (2007), Singer and Page (2015) raised Paracanthocobitis to genus status to contain the remaining nine “Acanthocobitis” species and five new species described therein.